The gene-editing technology called CRISPR has its origins as a bacterial immune system against viruses, a feature which could be turned against them in the future. By arming bacteriophage viruses with the tools to force bacteria into falling on their own swords, scientists hope we will be able to develop powerful new ways to defeat antibiotic resistant pathogens and perhaps even shape our body’s microflora. Research presented at the CRISPR 2017 conference in the US described the progress that has been made in modifying viruses that target specific bacteria with genes that make the host’s enzymes cut into its own DNA. Clustered regularly interspaced short palindromic repeats – CRISPR for short – are sequences of DNA made of a repeating codes that form a long palindrome. Bacteria produce them as a kind of immune system against viruses called bacteriophages, slipping bits of the virus’s genes scavenged out of the environment into the repeating codes. With the viral DNA stored away in CRISPR sequences, any future infections can be detected quickly and a CRISPR-associated system (or cas) enzyme can then use the sequence as a beacon, latching onto the infecting virus genes and either snipping them selectively or tearing them to shreds. About 25 years ago, researchers realised this cut-and-paste system of CRISPR sequences and cas enzymes could be used in the lab to edit sequences artificially, and a new engineering toolkit was born. The technology has been in the news quite a bit in recent years as advances have been made in applying it to cancer treatments and even eliminating HIV infections. While it might not be without certain risks, CRISPR gene editing has sparked a something of a minor revolution. Bringing it back to its roots and turning it into a weapon against its creators has a sense of serendipity about it. “I see some irony now in using phages to kill bacteria,” said the chief scientific officer of Locus Biosciences, Rodolphe Barrangou, at the CRISPR 2017 conference. Using bacteriophages as a form of therapy to treat infection isn’t all that new, with trials dating as far back as the 1920s. The use of phages is appealing because they are far more specific than antibiotics, targeting only specific types of bacteria and therefore posing no risk to our own health. The viruses can also penetrate the coatings of sticky film bacteria produce for protection and adherence. Russia experienced a fair degree of success with phage therapy behind its Iron Curtain during the Cold War, but unable to patent the naturally occurring viruses and with the bacteria quickly adapting, red tape and limitations in technology have made it far easier to focus on antibiotics in the west. With looming epidemics of superbugs on the horizon, attention is returning to bacteriophages as ways to kill bacteria, and CRISPR has put a new spin on the old idea. A spin-off company from North Carolina State University, Locus Biosciences is testing the limits of CRISPR technology, including giving bacteriophages CRISPR sequences containing codes for antibiotic resistance genes. Targeting bacteria with the genes, the CRISPR sequence would form a target for the bacteria’s own cas enzymes, effectively blocking resistance or even prompting the bacteria into chewing up its own DNA and self-destructing. In recent years our eyes have been opened to how complex our relationship is with bacteria in our environment, and how dull our tools are for dealing with them. Variations in our gut microflora has been linked with everything from Parkinson’s disease to autism to obesity, suggesting the species of bacteria we harbour could have major ramifications on many aspects of our health. With its razor-honed surgical precision, it’s possible the technology could one day be used to select specific strains of bacteria in our gut, deleting them from the ecosystem and allowing us to edit our microbiomes. Given we’re practically at the dawn of both CRISPR technology and our grasp on the complexity behind our body’s bacterial ecosystems, we can only speculate for the time being. As antibiotics slowly lose their shine it’s probably worth paying close attention to radical new solutions such as these. This entry was posted in Bacteria, Biotechnology, Cancer, HIV AIDS and tagged bacteriophage, Cancer, cancer treatment, Cancer treatment for HIV treatment, CRISPR, DNA, HIV, HIV AIDS, Immune system. A new type of non-invasive cancer test has just delivered promising results in an early-stage feasibility study, paving the way for a future when we’ll be able to get highly accurate cancer screening with a simple blood test. The technology, which involves scanning the blood for bits of DNA shed by tumours, is also referred to as a ‘liquid biopsy’, and these new results are getting us one step closer to a major upgrade in cancer diagnostics. Right now, our best method for detecting cancer is a biopsy – cutting out a small piece of the tumour tissue for lab analysis. But biopsies are often painful and invasive, and you need to already have a tumour or at least a suspect tumour to cut something out of it. That’s why scientists have been working on devising blood tests that can do the same thing without any surgery, and with the promise of delivering a diagnosis much earlier. Finding cancer in the blood is possible when scientists focus on DNA fragments shed into the bloodstream by tumours. This is called circulating tumour DNA (ctDNA). In recent years, scientists have been working on finding the best method for detecting ctDNA, using samples from patients who already have diagnosed cancer. The latest study, which was just presented at the 2017 meeting of the American Society of Clinical Oncology (ASCO), has turned up the dial on what scientists can find when they scan for ctDNA. “Our findings show that high-intensity circulating tumour DNA sequencing is possible and may provide invaluable information for clinical decision-making, potentially without any need for tumour tissue samples,” says lead researcher Pedram Razavi from Memorial Sloan Kettering centre. The team used blood and tissue samples from 124 metastatic breast cancer, lung cancer, and advanced prostate cancer patients. They scanned the samples for 508 different gene mutations, going over the specific regions of the genome up to 60,000 times. According to the scientists, this method generates 100 times more data than other sequencing approaches. To see whether the method could catch any tumour DNA floating around in the blood, the team compared the results with those from tissue samples and genetic material from the patients’ own white blood cells. “Our combined analysis of cell-free DNA and white blood cell DNA allows for identification of tumour DNA with much higher sensitivity, and deep sequencing also helps us find those rare tumour DNA fragments,” says Razavi. The researchers detected 864 genetic changes across all three types of cancers in the tissue samples, and found 73 percent of those in the blood tests as well. In 89 percent of the patients, they found at least one mutation in both tumour tissue and in blood. For breast cancer, for which liquid biopsies are more established, the success rate was 97 percent. A huge benefit of having sensitive ctDNA tests is the chance of finding cancer years earlier than is possible with a biopsy, catching it before it has time to spread through the body. The new method was developed with researchers from Grail, a genomics company dedicated to early cancer detection, backed by philanthropic funding from people like Jeff Bezos and Bill Gates. Grail’s Mark Lee, who was one of the study co-authors, told Reuters that the company is now planning to use this new test to gather large-scale data from hundreds of thousands of people, both with and without cancer. While the results are promising so far, the team will be needing a lot more research before this technology becomes an early detection tool that we all can benefit from in a routine check-up. “It’s an important first step. We show that what we call a high-intensity approach works,” Razavi told Reuters. The results were presented at the ASCO Annual Meeting, and have been accepted for publication in the Journal of Clinical Oncology. This entry was posted in Biotechnology, Cancer, Clinical Research and tagged anticancer drug, blood test to detect cancer, Cancer Cure, cancer diagnosis, detect cancer. Salmonella is commonly linked to fevers and food poisoning, and generally speaking, it isn’t good news at all for your body. But scientists have come up with an exception: a genetically engineered form of Salmonella bacteria that can eat away at cancer tumours. The modified bacteria target tumours in the brain rather than seeking out the human gut where Salmonella usually causes damage – and the technique could lead to a highly targeted technique of fighting one of the worst types of cancer there is. Researchers from Duke University gave the treatment to rats with the aggressive brain cancer glioblastoma, and saw significant increases in lifespans, with 20 percent of the rodents surviving an extra 100 days compared to control animals – the equivalent of 10 years in human terms. “Since glioblastoma is so aggressive and difficult to treat, any change in the median survival rate is a big deal,” says one of the team, Johnathan Lyon. It’s a promising direction of study, since survival rates of humans with this cancer are pretty bleak. Only about 30 percent of patients with glioblastoma live for more than two years after diagnosis. Part of what makes it so hard to treat is that the tumours hide behind the blood-brain barrier, which separates the circulating blood from the brain’s own fluid. Conventional drugs can’t easily reach through this membrane, so a more targeted approach is needed to stop glioblastoma from thriving. To achieve this, the researchers used a genetically adjusted and detoxified form of Salmonella typhimurium, modified to be deficient in a crucial organic compound called purine. 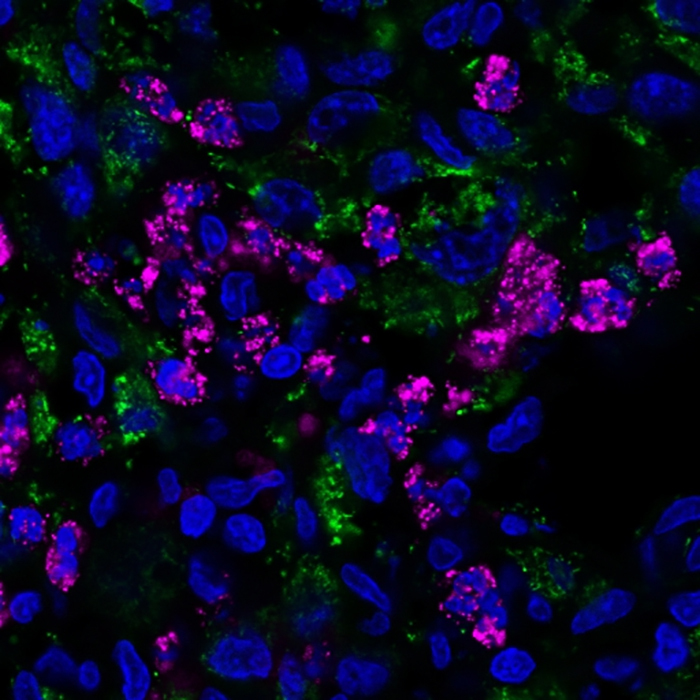 Glioblastoma tumours are an abundant source of this enzyme, which induces the bacteria to seek out the cancer cells to get the purine that they need. And when the bacteria get to the tumours, two more genetic tweaks kick into action. Because cancerous cells multiply so quickly, oxygen is scarce inside and around tumours. Knowing this, the scientists coded their Salmonella to produce two proteins called Azurin and p53 in the presence of low levels of oxygen. These compounds instruct the cancer cells to effectively self-destruct, so the end result is like a genetically-coded guided missile, seeking out the tumour and blitzing cancerous cells when it arrives. The researchers say the technique is much more accurate than surgery, and because the bacteria are otherwise detoxified, there should be no damaging side effects for the patient. Of course, having success with a group of rats is no guarantee that the treatment will translate to the human body, but the researchers are hopeful that the technique can be developed to treat cancer patients in the future. The first step is to get that 20 percent success rate up. Based on initial tests, the 80 percent of cases where the treatment had no effect could be down to the tumour cells outpacing the bacteria, or inconsistencies in the Salmonella‘s penetration in the body. “It might just be a case of needing to monitor the treatment’s progression and provide more doses at crucial points in the cancer’s development,” says Lyon. The research has been published in Molecular Therapy Oncolytics. This entry was posted in Bacteria, Biotechnology, Cancer. Scientists just completed a trial of a new, non-surgical prostate cancer treatment that uses a tumour-killing drug based on ocean bacteria, and the procedure saw almost half the patients go into complete remission. The treatment is known as vascular-targeted photodynamic therapy (VTP), and is made possible by a drug called WST11, which is derived from bacteria that live at the bottom of the ocean. These light-sensitive organisms convert photons into energy, and when the same trick is mimicked by WST11, the compound kills cancer cells. In a broad clinical trial at 47 treatment sites across 10 different European countries, 49 percent of patients with early prostate cancer that were treated with VTP went into complete remission, compared with 13.5 percent in the control group. “These results are excellent news for men with early localised prostate cancer, offering a treatment that can kill cancer without removing or destroying the prostate,” says lead researcher Mark Emberton from University College London. Men diagnosed with early or low-risk prostate cancer are usually monitored via regular testing to make sure the cancer isn’t spreading. But if it does begin to spread, patients face a dilemma, as traditional treatments such as surgery or radiation therapy can cause lifelong erectile problems and incontinence. For these reasons, a non-surgical treatment that doesn’t come with such negative side effects has long been a goal of researchers, and VTP with WST11 could be it. In the study, the procedure only caused short-term urinary and erectile problems, which had resolved within three months, and all other side effects disappeared within two years. “This changes everything,” Emberton told James Gallagher at the BBC. The treatment involves injecting WST11 into the bloodstream, and inserting optical fibres into the prostate gland. When the optical fibres are turned on, light beams activate the drug in the patient’s blood, causing it to release high-energy free radicals that destroy tumour tissue while leaving surrounding tissue unharmed. Of the individuals who took part in the trial, cancer progressed in 58 percent of men in the control group, who maintained regular monitoring during the study. But for the men who received VTP, only 28 percent saw tumours spread. According to Emberton, these results would be even stronger today, as the researchers in the trial didn’t have access to the latest MRI technology when they began their study in 2011. “We can now pinpoint prostate cancers using MRI scans and targeted biopsies, allowing a much more targeted approach to diagnosis and treatment,” Emberton said in a press release. There’s also scope to extend the procedure to other cancers, including breast and liver cancer, but first the researchers need to continue monitoring the patients who took part in this trial and see if the remission rates hold up over time. Meanwhile, the European Medicines Agency (EMA) is currently reviewing the treatment, but it could be years before it’s made available to patients in the broader population. It’s important to note that there’s still a lot we don’t know about this treatment, and despite its early promise, it’s not necessarily more effective than surgery or radiation therapy at removing the danger of cancer. That said, it also doesn’t seem to offer the same kinds of complications, so depending on how further research pans out, it could be a valid avenue of treatment in the future. One man who hopes the wait isn’t too long is Gerald Capon, a 68-year-old from West Sussex in the UK, who took part in the study. “[T]he trial changed my life. I’m now cancer-free with no side effects and don’t have to worry about needing surgery in future,” he says. The findings are reported in The Lancet Oncology. This entry was posted in Bacteria, Cancer. The U.S. Food and Drug Administration today allowed marketing of a new tissue expander system for soft tissue expansion in two-stage breast reconstruction following mastectomy and in the treatment of underdeveloped breasts and soft tissue deformities. A patient uses a dose controller to independently inflate the expander. A tissue expander is a balloon-like device that has a soft, expandable polymer shell and is gradually filled with saline or air. Tissue expanders are typically used prior to breast reconstruction to cause breast tissue and muscle to stretch over time, which creates a space (called a “pocket”) for the breast implant. The AeroForm device is a wireless tissue expander for patients who choose to have reconstructive surgery following a mastectomy. Most women who have mastectomies to treat or prevent breast cancer are eligible for breast reconstruction. The AeroForm tissue expander system has two main components: a sterile implant with an outer shell made of silicone (called the “expander”) and a remote dosage controller (called the “controller”). The expander contains a reservoir of compressed carbon dioxide. The controller is a hand-held device that communicates with the receiving antenna and electronics located in the expander. The controller is used to communicate to a valve in the reservoir to release carbon dioxide and gradually inflate the expander. The controller is pre-programed to limit releasing a small amount of carbon dioxide once every three hours, up to a maximum of three times per day. The AeroForm tissue expander differs from available saline-filled tissue expanders. Saline expanders are expanded by the surgeon and use a needle to pierce the skin and inject saline into the expander through a port or injection area. The AeroForm tissue expander is filled with air; there is no need for a needle and the patient has some control over slowly expanding the device at home. The FDA reviewed results from a clinical trial of 99 patients using the AeroForm expander and 52 patients using the saline expander. The results showed that 96.1 percent of patients using AeroForm expanders and 98.8 percent of patients using saline expanders were able to have their breast tissue successfully expanded and exchanged to a breast implant. A surgeon must determine whether the patient is a suitable candidate for treatment with the device. Patients must not have any residual tumor at the expansion site and must not undergo magnetic resonance imaging (MRI) while the device is in place. Patients with another electronic implant (e.g. pacemaker, defibrillator, or neurostimulator device) are not eligible for treatment with the AeroForm tissue expander. The most common adverse events seen in the study were necrosis, seroma, post-operative wound infection and procedural pain. Patients using the AeroForm device in the clinical trials did not report any serious adverse events. The FDA reviewed the data for the AeroForm system through the de novo premarket review pathway, a regulatory pathway for some low- to moderate-risk devices that are novel and for which there is no legally marketed predicate device to which to claim substantial equivalence. AeroForm is manufactured by AirXpanders of Palo Alto, California. This entry was posted in Cancer, Clinical Research, Clinical Trial, USFDA.